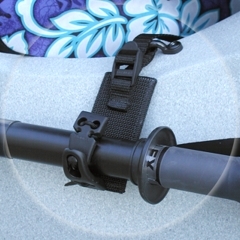 Attach these keepers to any strap eye along the gunwale with the simple strapping clip to hold paddles or fishing rods securely on the side of the boat. Handy for storage too. Set of two kayak paddle holders. Made in USA. Lifetime guarantee.